Acktar, a provider of deep black light-absorbing coatings and materials, will showcase its series of test specimens for active opto-electronic protective devices responsive to diffuse reflection. 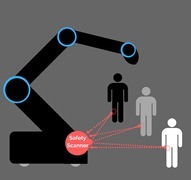 Such protective devices are part of safety-related systems, which are mainly used in the human-machine interaction. Therefore the protective devices are subject to particularly stringent safety requirements. A reliable detection of people and objects and thus, the proper function of the safety scanners is essential to prevent a collision. The product norm DIN CLC/TS 61496-3 sets requirements for the construction, assembly and testing of such electrosensitive protective equipment for the detection of persons. During the scanning process, both the character of the obstacles (especially clothes), as well as the reflection of ambient light, pose a significant risk of interferences for the optoelectronic signal detection. Based on the requirements DIN CLC/TS 61496-3, ACKTAR has developed a range of various test specimens, which provide the requisite conditions for the functional test of safety scanners.